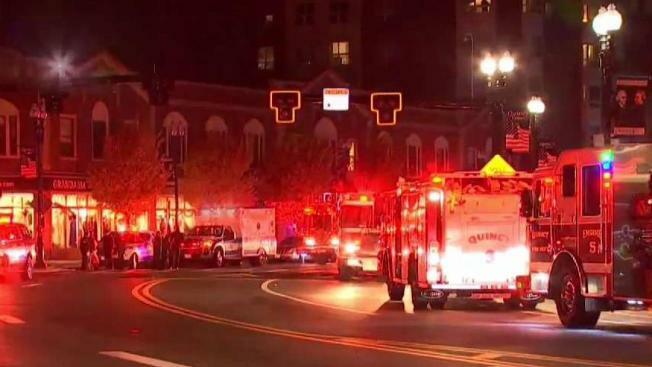 A reported odor in Quincy, Massachusetts resulted in the call for a hazmat crew and subsequent cancelation of evening classes. Two women have been arrested after they allegedly triggered a hazmat response at a Massachusetts college. Police responded to a call of a conscious woman who was experiencing difficulty breathing and pain at 5:38 p.m. on Wednesday at Quincy College. Upon arrival, several people reported complaints of trouble breathing, dizziness, coughing and itchy skin. The Quincy Fire Department ordered the third floor of the building to evacuate and eventually ordered the rest of the building to follow. Several people were transported to a nearby hospital for non-life threatening injuries and classes were canceled as a result. Officials deemed the structure safe at approximately 9 p.m. and investigators arrived at the scene. They reviewed surveillance footage and saw two women using a can of pepper spray in the third floor’s lounge area. The women, identified by authorities as 18-year-old Hannah Craig of Medford and 19-year-old Samani Freeman of Mattapan, were arrested after they were found on Coddington Street. Quincy police say a can of pepper spray was seized as evidence. Craig and Freeman were charged with assault by means of a dangerous weapon, assault and battery with a deadly weapon, disturbance of school or public meeting, filthy substance in building and disorderly conduct. Quincy College confirmed Thursday night that the suspects are students at the school. Both have been suspended. Details on a future court date were not immediately clear. It is not clear if either suspect has a lawyer.